TORONTO, Feb. 14, 2018 /CNW/ - Carleton University, BMO Financial Group and The Beacon Agency released a study today that finds women entrepreneurs are innovating every day across Canada, but their significant non-tech innovations largely go unrecognized and rules around grants and incubators that could help often exclude them. The report, entitled Everywhere, Everyday Innovating – Women Entrepreneurs and Innovation, delivers new insights based on interviews with 146 diverse female entrepreneurs across Canada, including 23 Indigenous women and a survey of another 1,000 female business owners. It recommends inclusive innovation policy from cross-industry decision makers to remedy the situation. 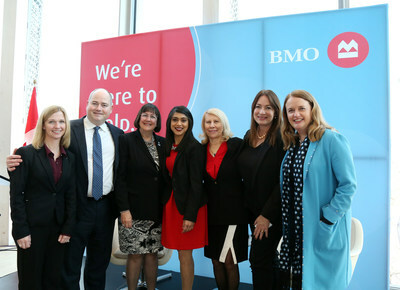 "We are proud to help foster conversation about what is needed to create better opportunities for Canadian female entrepreneurs," said Andrew Irvine, Head, Customer Solutions, Canadian Personal & Business Banking, BMO Bank of Montreal. "BMO is committed to learning from these discussions and using them to drive change in our industry that will benefit women entrepreneurs and support their success." "This study shows us what women already know to be true: that there is much more that we all can do to support women entrepreneurs and business owners," said the Honourable Bardish Chagger, Leader of the Government in the House of Commons and Minister of Small Business and Tourism. "It starts with a stronger support network, more coordinated investments and greater access to capital, but that's only part of the solution. We also need a culture shift. As innovation changes our economy, women entrepreneurs will be key to our future success. We need more women in business – for our economy, and more importantly, for our society." The report found that most policies and financial assistance programs currently equate innovation solely with technological advances, and therefore don't consider how women are innovating much more broadly. Many of the entrepreneurs interviewed noted that they do not feel welcome or included in the focus of mainstream networks, incubators and accelerators. Indigenous women entrepreneurs noted experiencing the same challenges, in addition to burdens including prejudice and lack of access to business training on-reserve. Some women entrepreneurs interviewed for the study said they experienced a range of discrimination and sexism, from comments about their appearance, level of experience, knowledge, and attire to a lack of understanding about how women's business pitches are different from men's. "It is vital to fully recognize the invaluable innovation contributions women entrepreneurs are making in Canada," said Janice McDonald, Co-author & President of The Beacon Agency. "An inclusive innovation strategy will enable female entrepreneurs to thrive and the economy to benefit." Establishing training, mentorship programs and networking opportunities on-reserve to further improve support for new Indigenous women entrepreneurs. To view the full report, go to https://bmoforwomen.bmo.com/ or www.carleton.ca/creww and join the conversation on social, using #BMOforWomen. Located in the nation's capital, Carleton University is a dynamic research and teaching institution with a tradition of leading change. Its internationally recognized faculty, staff and researchers provide more than 28,000 full- and part-time students from every province and more than 100 countries around the world with academic opportunities in more than 65 programs of study. As an innovative institution Carleton is uniquely committed to developing solutions to real-world problems by pushing the boundaries of knowledge and understanding daily. The Beacon Agency is a strategic consulting firm that advises clients in the private, public and not-for-profit sectors. They have a special focus on working with innovative brands to make the good they do count. Headquartered in Ottawa, it is led by award-winning entrepreneur Janice McDonald @janicemcd http://www.beaconagency.ca.